When a highly-inbred horse does well on the track and is bred to outcrosses, watch out, world! I responded to a comment in an earlier post that a mare with considerable inbreeding often yields superior runners when she's outcrossed, but will generally fare poorly at the track herself. When a filly with close-up pedigree duplications actually goes out and scores well in her own race career, she's as close to a "sure thing" that you'll ever find in a broodmare prospect. Okay, so you have a mare that's inbred to strong pedigree influences, and she has a good chance of success when outcrossed. Does it work the other way around? It does. Quiet American (on SRO) is just one example of a stallion who's heavily inbred and who gets an exceptional number of good runners and more than his share of "big horses." Looking at his pedigree, he's got "Dr. Fager over a daughter of the great mare Cequillo" on top (resulting in Killaloe, dam of his sire, Fappiano) and on bottom (resulting in Demure, his own dam). Dr. Fager himself was the result of inbreeding - he had Bull Dog 3x4, multiple instances of Teddy, and both Spearmint and Whisk Broom 5x5. A.P. Indy (on SRO) is a stallion whose inbreeding comes as a bit of a surprise to many who study five-cross pedigrees. As the sire of a given horse, you see only four generations of A.P. Indy's pedigree. So, if you're looking at an A.P. Indy offspring (take a look at Bernardini here -- a fine stallion who has A.P. Indy over a Quiet American mare), the only duplicated horse shown for him is Bold Ruler. But when you look at his own pedigree (see it here), you notice that he has colored boxes all over the place. Specifically, he is: 4x3 to Bold Ruler, 5x5x4 to Nasrullah, 5x5 to Turn-to, and 5x4 to Princequillo, as well as 3x5 to Somethingroyal via his dam. Okay, so where am I going with all this? BIG BROWN. If you haven't already gotten on this colt's bandwagon for his racing accomplishments (here's a recap of his commanding Florida Derby (gr. I) win), get ready to see lots more of this fellow in the future. As in, during his post-race career. Big Brown (pedigree) has a fascinating pedigree pattern. 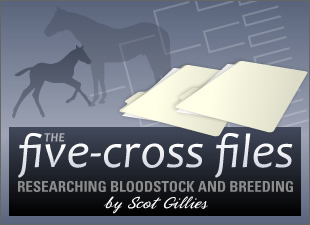 On both sides, a male-line descendent of Northern Dancer was bred to a female-line descendent of the Damascus-Round Table cross. This mating choice wasn't a fluke, it was an inspiration. The fact that he's been so successful (3-for-3 thus far) is exciting for all of us pedigree geeks. Big Brown looks towards Louisville in one month, and is well-placed to be amongst the favorites. (You can read lots more about Big Brown in my buddy Jason Shandler's Triple Crown Talk blog -- he's been watching the Rick Dutrow Jr.-trained powerhouse for the last month.) I'll sure be watching for Big Brown near the lead at the top of the stretch on Derby Day (although I've got to say I'll still be rooting for my favorite, Anak Nakal -- another pedigree with a great inbreeding pattern! -- if he makes it. Steve Haskin doesn't seem too high on my guy).